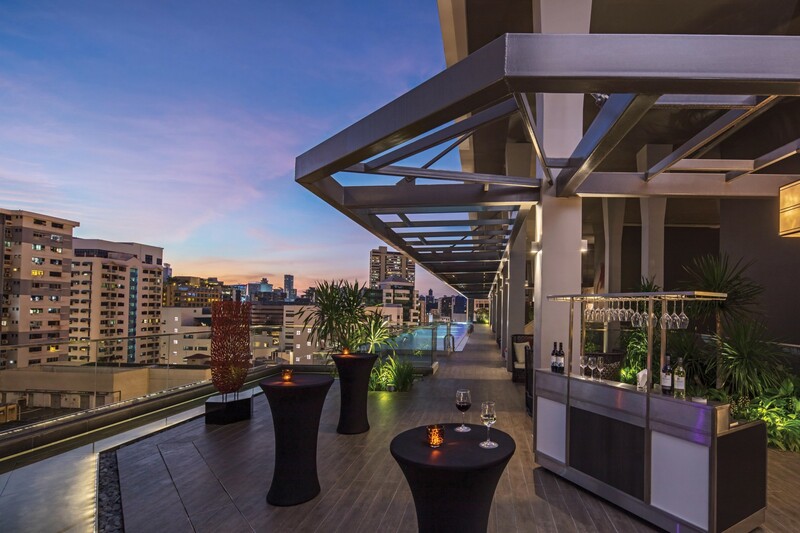 Located in the heart of Singapore’s arts and cultural district, Bugis-Bras Basah, Mercure Singapore Bugis offers travellers and guests the advantage of being surrounded by a myriad historical and cultural sites, trendy shopping malls with hip and diverse eateries. Embark on our specially curated trail to experience the must-see sights in this heritage enclave! 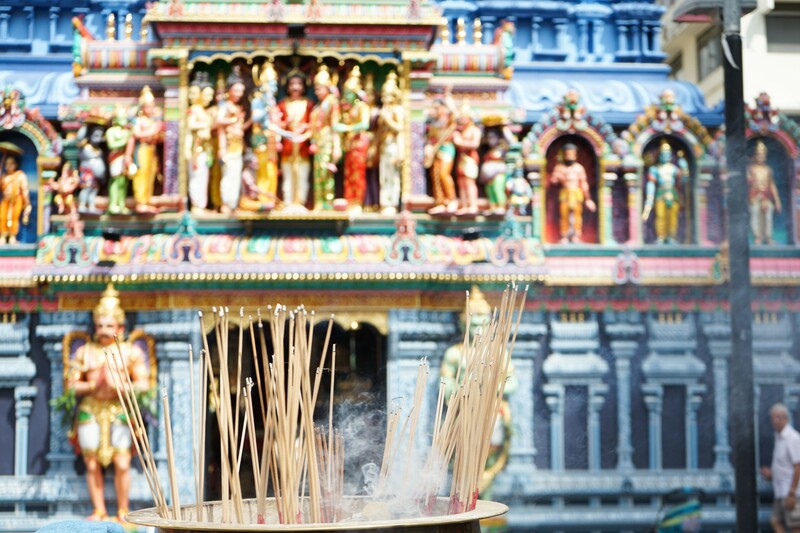 Starting the trail right next to Mercure Singapore Bugis, Waterloo street is a true showcase of Singapore’s multicultural society and religious harmony where both Chinese and Hindu temples coexist right next to each other. The Sri Krishnan Temple is hard to miss with its vibrantly coloured exterior. One of the oldest Hindu temples at 148 years old, the classical South Indian Hindu temple stands impressive with colourfully painted statues greeting its devotees at the main entrance. Spot the deities adorned with precious stones from India while admiring the charming detailed carvings. Situated right next to the Kwan Im Thong Hood Cho temple, don’t be surprised to see Buddhist devotees paying their respects here! 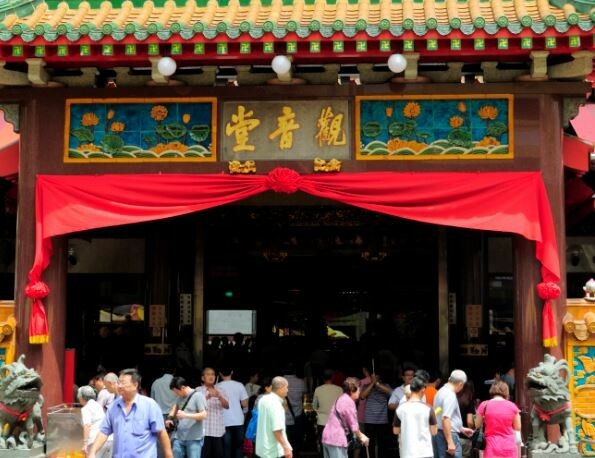 One of Singapore’s oldest and most visited Buddhist temples, Kwan Im Thong Hood Cho Temple is dedicated to the Goddess of Mercy who is believed to bring good luck to worshippers. Amazingly, it was left undamaged during World War 2 while the surrounding buildings were destroyed, lucky indeed! During Chinese New Year Eve, expect thousands of devotees to queue overnight to enter the temple for an auspicious start to the New Year. So why not pay a visit and be blessed with plenty of luck while you’re here! Do not miss the statue of the Laughing Buddha when you’re at the temple, an iconic symbol of good luck at Waterloo Street. One believes that stroking the Buddha’s tummy will bring good luck and happiness in return. So join in and give yourself a stroke of luck! 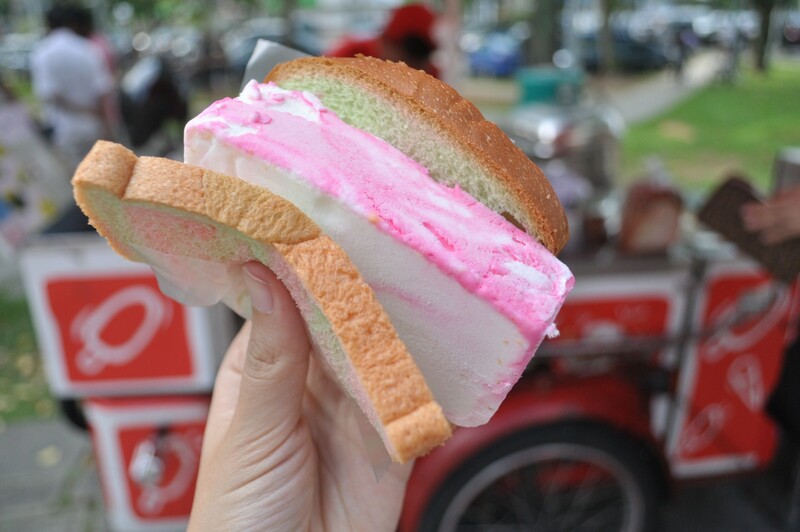 The small mobile carts with bright coloured umbrellas along Waterloo Street is where you’ll want to stop by for a uniquely Singaporean treat- the rainbow ice cream sandwich bread. At $1 to $1.20, choose from a variety of flavours and eat it sandwiched between a wafer, rainbow bread or on it’s own! The perfect way to beat the tropical heat! Still feeling hungry? 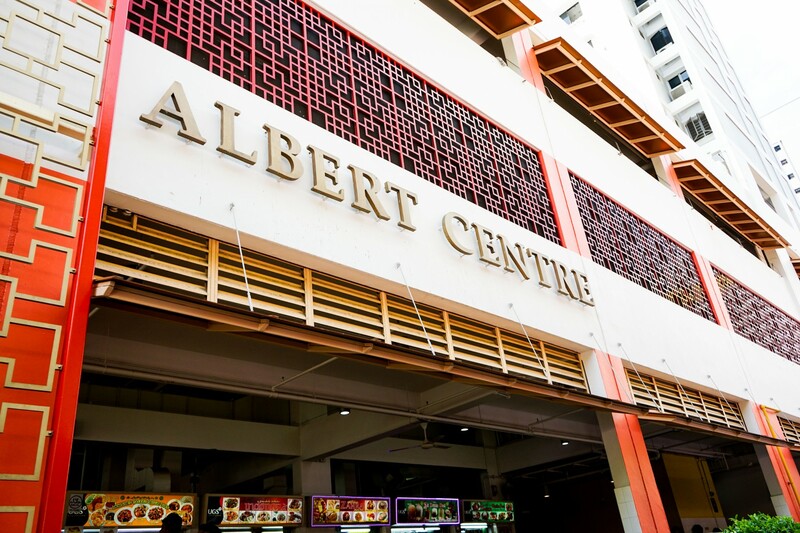 Stop by the popular Albert Centre Food Court that is always buzzing with life from swamps of people queuing for their favourite food stall. Be spoilt for choice with a diverse range of mouth-watering Singapore delicacies and the affordable prices will make sure that your order till your tummies are filled! Want to find out where the best stalls are? Just spot the snaking queues and you know where to head next. Some highly recommended stalls to try include Bai Nian Niang Dou Fu, Ma Bo Lor Mee, Tong Cheng Yuan Soya Bean, Angel Horse Teochew Fish Soup and more! 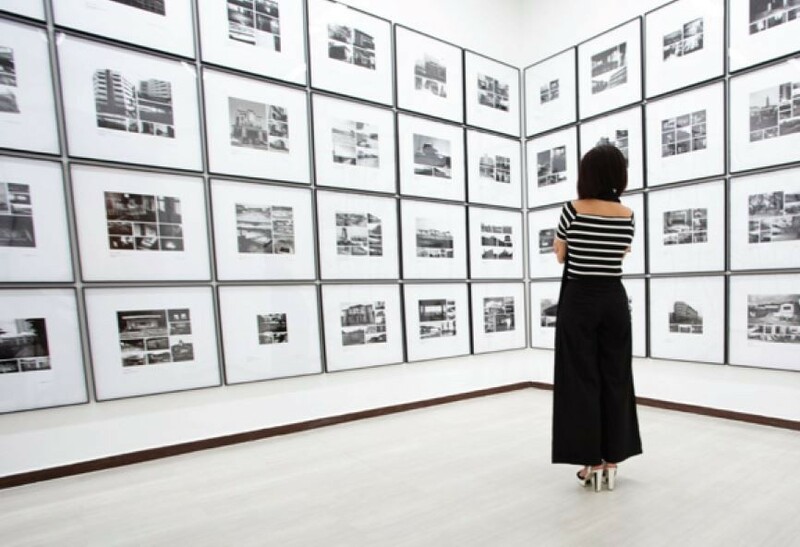 Get artsy with local and SEA contemporary artworks on display at the Singapore Art Museum, the first to be established in Singapore in 1996. Admire the beautiful 19 century architectural exterior of a restored mission school before stepping into a world of contemporary art exhibits that will inspire you! 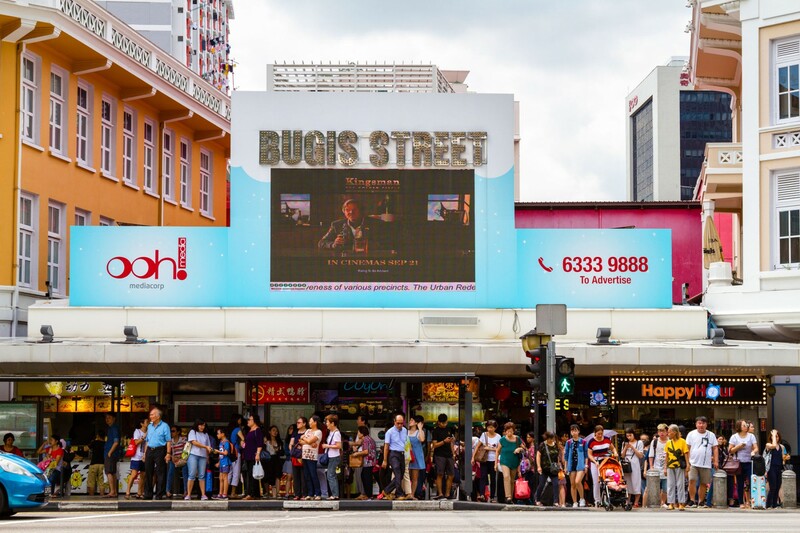 One of Singapore’s hottest area to do your shopping sprees without breaking the bank, the vibrancy of the old Bugis Street has lived on till today, popular among tourists and locals alike. Previously an attractive destination for its night life and street hawkers from the 1950s to 1980s, especially among sailors and British and American soldiers, it is now a shopper’s heaven where you can find trendy clothes and quirky souvenirs! Remember to set aside some time to discover the bustling shopping street! 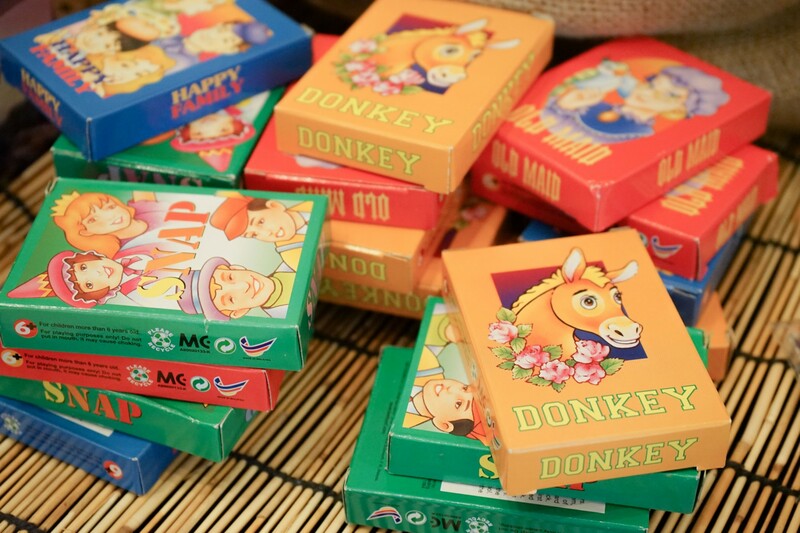 Have a blast back to the past at this nostalgic toy store selling childhood toys and games of all sorts that Singaporeans grew up with. Spot the colourful Chapteh (feathered shuttlecock), Five Stones, Classic Card Games and more as you navigate through rows of quirky looking trinkets and bring a few back home as gifts ! As you make your way towards the Sultan Mosque, you are entering the historic Kampong Glam, a Malay-Muslim enclave where you can experience their cultural heritage and explore the treasure trove of trendy exotic restaurants, indie boutiques, traditional shop houses selling colourful textiles, Islamic books, arts and crafts and more. 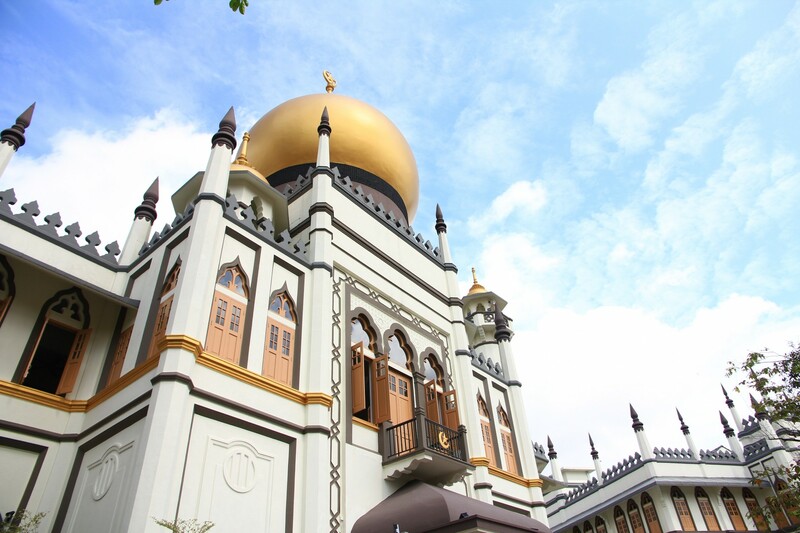 The Sultan Mosque is one of Singapore’s most important place of worship for Muslims. An impressive looking building originally built for the first sultan of Singapore in 1824, Sultan Hussein Shah, look closely at the gold coloured domes and you will find that each dome base is decorated with glass bottles. These were donated by poor Muslims who wanted to contribute in their own little ways during construction, a heart-warming story indeed! Continue your shopping spree journey of a different kind at Haji Lane, a quaint tiny lane hidden away in the heart of the Muslim quarter, and one of the narrowest street in Singapore. Haji Lane is an artsy gem loved by hipster crowds of locals and tourists alike. 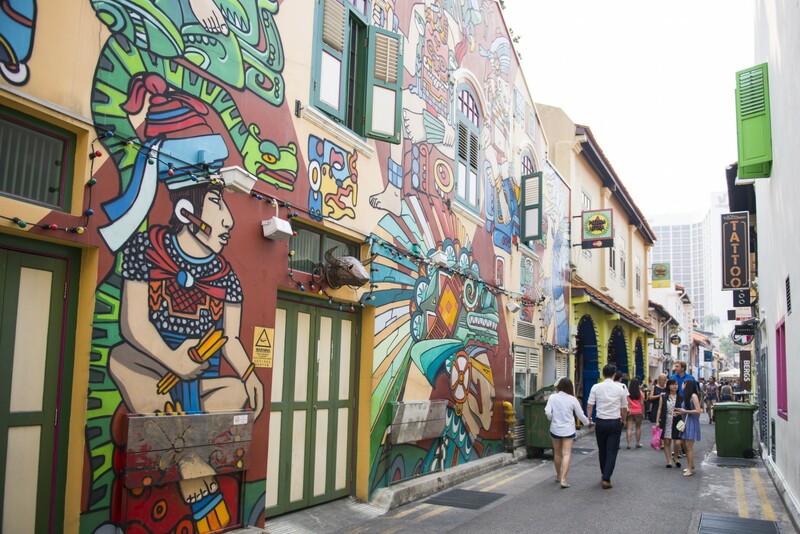 In the day, explore through colourful rows of heritage Peranakan style pre-war shophouses, quirky street art, charming cafes, fashion boutiques and snap up some Instagram worthy shots at the colourful graffiti wall murals! After a day of exploring, return to Mercure Singapore Bugis and chill by our infinity pool , dine at an all day dining western restaurant Royale to savour a gastronomic spread of international and local fare, enjoy modern Cantonese cuisine with a unique twist at Song Garden, or unwind with a bespoke cocktail at BARtistry@122 for the perfect end!